How Long Should Heater Coils Last In My Vape? There seems to be a bit of confusion when it comes to how long heater coils will last. Generally speaking coils last 2-4 weeks however, every vaper is different so it’s important to use the 2-4 week recommendation only as a benchmark. Below is a list of factors to consider when determining how long a coil will last. VG/PG Consistency of Your E-liquid. Higher VG liquid has a thicker consistency and therefore will cause the coil to deteriorate much faster and it will need to be replaced more often. Chain Vaping. If you are taking puffs consecutively, one after another this could cause a dry hit and shorten the lifespan of your coil. This is because the coils need time to re-saturate with e-liquid and if you chain vape especially with thicker liquid there isn't enough time to become saturated and you will get a taste of burnt cotton. How Much You Vape. If you are a heavy vaper who consistency vapes throughout the day you’ll need to change your coil more frequently then someone who vapes scarcely or sporadically throughout the day. 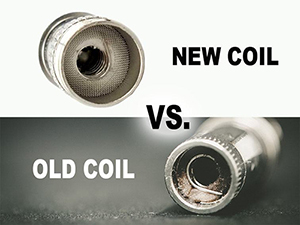 The lifespan of a coil is measured by hours of vaping versus days since it’s been replaced last. Dry Hits. If you don’t notice your tank is empty and you take a drag of your vape it could damage the coil instantly. Follow Coil Rating. It’s best to check the coil rating to see the recommend wattage range because every coil is different. If you run your device above or below the ideal range if could shorten the lifespan of your coil. Length of Puff. If you’re puffing on your vape at a lower wattage and taking longer puffs it will burn your coil out quicker than if you vaped at a higher wattage and took shorter puffs. A rule of thumb to follow is whenever you are using higher power your puff should be shorter. Typically you should stay within a 3 second puff to help with the longevity of the coil. Typically a heavy vaper who consistently vapes throughout the day could replace their coil anywhere from 4-7 days. A moderate vaper who vapes fairly consistently throughout the day taking only a few drags at a time could replace their coil up to the 3 week mark. If you’re a light vaper who takes a few drags throughout the day a coil could last a month or more. Please note this is only an estimation, coils could last longer or die sooner depending on the other factors mentioned above as they all affect the lifespan of a coil. If you’re looking for extend the life of your coils one option would be switching to ceramic coils. Not every tank is compatible with ceramic coils so it’s best to ask your vape shop what your options are. Ceramic coils are more expensive but are meant to last twice as long as regular coils. Please note that ceramic coils require more time to saturate so its recommended to wait a bit longer before vaping on a brand new ceramic coil.